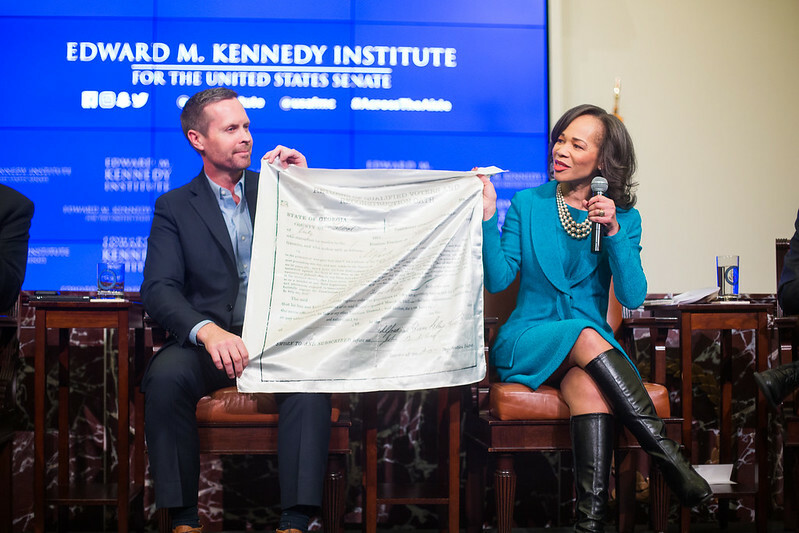 On Monday, December 17, the Kennedy Institute partnered with the U.S. Association of Former Members of Congress to host a bipartisan panel of current Members for a powerful discussion about how to promote civility in political discourse and forge common ground in Congress. In a conversation moderated by the Washington Post’s Paul Kane, Congressman Rodney Davis (R-IL-13), Congressman Joe Kennedy III (D-MA-4), Congressman Markwayne Mullin (R-OK-2), and Congresswoman Lisa Blunt Rochester (D-DE-At Large) talked about the impact of the changing balance of power for the 116th Congress, the importance of personal friendships in Washington, and how we must all promote civility, respect, and truth in order to sustain a healthy and productive political dialogue. Members also responded to audience questions about how teachers can best educate students about today’s political climate, the status of bipartisan efforts around immigration and health care, and the change of party power on Capitol Hill. The complete discussion is available for viewing below. which offer an inspirational and moving example of how all Americans, regardless of party or political beliefs, have an important role to play in combating divisive political rhetoric and in planting seeds of progress for future generations. A portion of comments from each Member’s closing remarks are transcribed below, and available for viewing here.